From Lytton Highway 1 heads north east along the Thompson River. The highway crosses the river at Spences Bridge 40 km (25 mi.) from Lytton. Spences Bridge is famous for the quality of its steelhead fishing and the site of one of the oldest operating hotels in British Columbia, the Steelhead Inn. 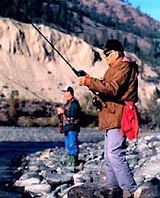 Every autumn, Spences Bridge attracts anglers eager to catch one of BC's most sought-after sports fish, the steelhead. 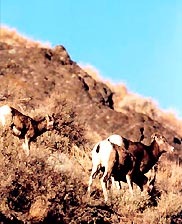 Travellers passing through in spring and fall are most likely to see herds of big horn sheep on or near the highway; you often have to slow down or stop completely to avoid hitting them. A favourite spot for the sheep is in the school yard - when the students are inside! Recreation Facilities & Activities: river rafting; steelhead fishing; wildlife viewing; camping; hiking. Accommodations: There are a couple of motels in Spences Bridge, including the oldest operating hotel, the Steelhead Inn right on the river's edge. There is also a private as well as a British Columbia Provincial Campsite (Goldpan Provincial Park) under 10 km (6 mi.) from Spences Bridge.